Amyotrophic lateral sclerosis (ALS) is the most common adult onset motor neuron disease with no effective disease modifying therapies at present. Spinal cord degeneration is a hallmark feature of ALS, highlighted in the earliest descriptions of the disease by Lockhart Clarke and Jean-Martin Charcot. The anterior horns and corticospinal tracts are invariably affected in ALS, but up to recently it has been notoriously challenging to detect and characterize spinal pathology in vivo. With recent technological advances, spinal imaging now offers unique opportunities to appraise lower motor neuron degeneration, sensory involvement, metabolic alterations, and interneuron pathology in ALS. Quantitative spinal imaging in ALS has now been used in cross-sectional and longitudinal study designs, applied to presymptomatic mutation carriers, and utilized in machine learning applications. Despite its enormous clinical and academic potential, a number of physiological, technological, and methodological challenges limit the routine use of computational spinal imaging in ALS. In this review, we provide a comprehensive overview of emerging spinal cord imaging methods and discuss their advantages, drawbacks, and biomarker potential in clinical applications, clinical trial settings, monitoring, and prognostic roles. Amyotrophic lateral sclerosis (ALS) is a relentlessly progressive neurodegenerative disorder. Anterior horn pathology and corticospinal tract degeneration has been identified as a core feature of ALS since the earliest descriptions of the condition (1, 2). Despite repeated attempts to detect and characterize spinal cord pathology in vivo (3), technological constraints have traditionally precluded reliable quantitative spinal imaging in ALS. Due to the plethora of methodological challenges, such as the small cross-sectional area of the human spinal cord, respiratory, and cardiac movement effects, the overwhelming majority of imaging studies have focused on cerebral alterations in ALS (4). The diagnosis of ALS is primarily clinical and requires the careful exclusion of ALS-mimics (5). Given the heterogeneity of clinical presentations and the prevalence of atypical phenotypes, diagnostic delay in ALS is not uncommon, and the average period between symptom onset and definite diagnosis is ~12 months worldwide (6). The median survival from symptom onset ranges from 20 to 48 months (7–9). Progression rates in ALS show considerable variation, and prognosis depends on age at onset, region of onset, co-morbid cognitive impairment, nutritional status, and certain genotypes are associated with faster progression (10–16). Given the considerable clinical, cognitive, and genetic heterogeneity of ALS, there is an unmet need for early diagnostic biomarkers to aid patient stratification into specific phenotypes (17). Clinical trials of ALS continue to rely on survival, functional scores and respiratory measures as outcome measures despite the potential of candidate imaging markers (18). Magnetic resonance imaging (MRI) not only contributed to the characterization of ALS-associated cerebral changes, it has also contributed important pathophysiological insights, such as the role of inflammation (19), patterns of spread (20, 21), inhibitory dysfunction (22, 23), and network-wise propagation (24, 25). In addition to describing unifying disease-associated signatures, imaging studies of ALS have gradually characterized the features of specific genotypes (26, 27), phenotypes (28, 29), the substrate of cognitive and extra-pyramidal impairments (30), as well as presymptomatic (31) and longitudinal changes (32). Despite the momentous advances however, the overwhelming majority of imaging studies in ALS remain cerebral, overlooking a disease-defining site of ALS pathology; the spinal cord (3). One of the key challenges of spinal cord imaging stems from its elongated dimensions, small cross-sectional area in the axial plane coupled with long sagittal and coronal expansion (33). Furthermore, the cord is surrounded by tissues that have very different magnetic susceptibility profiles and is it subject to both direct (cardiac and respiratory) and fluid-mediated [cerebrospinal fluid (CSF)] movement effects. The main challenges of quantitative spinal cord imaging include (i) partial volume effects, (ii) an inhomogeneous magnetic field environment, and (iii) physiological and patient motion (34). Partial volume refers to scenarios where different tissues contribute to the same voxel. In spinal cord imaging this occurs when a voxel is at the CSF/white matter, white matter/gray matter, CSF/vascular, white matter/vascular interfaces. Signals from different tissue densities with different amounts of spins contribute to the total MR signal in these voxels, which results in indistinct tissue-boundaries. Partial volume effects can be reduced by increasing the spatial resolution, but this in turn results in lower signal-to-noise (SNR) and contrast-to-noise ratios (CNR). Magnetic fields strengths of three or seven Tesla compared to conventional 1.5 Tesla platforms (35–38), higher number of phased-array coils with parallel imaging (35, 38, 39), and corrections for physiological motion improves spatial resolution, SNR, and CNR (35, 38, 39). Due to its proximity to the lungs and the heart, almost the entire spinal cord undergoes repetitive displacement due to respiration, CSF, and cardiac pulsation (40–43). The movement of the human spinal cord linearly increases caudally with distance from the head. The available literature suggest that physiological anterior-posterior (A-P) cord movement (0.60 ± 0.34 mm) exceeds those observed in superior-inferior (SI) (0.4 ± 0.1 mm) and right-left (RL) direction (0.17 ± 0.09 mm) (44, 45). Spinal imaging is also susceptible to movement artifacts from swallowing and patient movements during long MR acquisitions which can create ghosting artifacts (42, 46). By “gating” the acquisition, i.e., synchronizing with the respiratory or cardiac cycles, the effect of periodical movements can be significantly reduced (38, 39, 47). Motion artifacts can also be reduced using “saturation bands” that cover the esophagus, chest, and abdomen, by attenuating signals from moving structures so that it does not corrupt the signal from the spinal cord itself. Velocity compensating gradient sequences and signal averaging across multiple phases of motion can also be applied to minimize motion artifacts. Reducing acquisition time by using fast sequences, i.e., fast-spin-echo, parallel imaging that increases acquisition speed by factors from 1.5 to 3, i.e., SENSitivity Encoding/GeneRalized Autocalibration Partial Parallel Acquisition-type reconstructions, partial Fourier imaging, reducing the size of the phase-encoded direction, and decreasing the k-space matrix size effectively reduce both physiological and subject motion effects (48–53). MRI compatible cervical collars, which minimize involuntary neck movements, may also reduce movement artifacts (46). Co-registration of all data when dealing with multiple series acquisition, e.g., diffusion tensor imaging (DTI) and functional MRI (fMRI), can also be performed to limit the inconsistency in derived maps (54, 55). The spinal canal is surrounded by bones, ligaments, disks, arteries, and venous plexi. Its proximity to the esophagus, mediastinum, and the lungs, each containing various amounts of air, create a challenging scanning environment. Adipose tissue, bone, and air have different magnetic susceptibility profiles, and respiration-induced B0 field fluctuations (43) also contribute to the inhomogeneity of the magnetic field around the spinal cord, resulting in geometric distortions and signal intensity loss (56). To some extent, these artifacts can be counteracted with “shimming.” Shimming aims at compensating for field inhomogeneities by creating an auxiliary magnetic field via shim coils (57). While shimming improves overall field homogeneity, it is limited to smooth variations across larger regions and cannot fully compensate for small, and localized field variations, such as those observed at cartilaginous discs between the vertebral bodies. Echo planar imaging sequences, such as DTI, are particularly sensitive to geometric distortions around vertebral disks. In addition to shimming, parallel imaging, and careful slices positioning may reduce magnetic field inhomogeneity, i.e., slices centered in the middle of each vertebral body and perpendicular to the spinal cord (38, 47, 58). The specific geometry of the magnetic field inhomogeneities should be considered in order to correct for its effect (59–61). The role of conventional spinal MRI in ALS is to rule of alternative structural, inflammatory or neoplastic pathologies which may result in a combination of upper and lower motor neuron involvement mimicking ALS (62). Compressive myelopathies and radiculopathies are relatively common and early, predominantly lower limb presentations of ALS are sometimes attributed to these radiological findings resulting in laminectomies and other invasive procedures (63, 64). Conventional, clinical spinal sequences are typically only qualitatively interpreted without specific measurements. The majority of clinical spinal scans in ALS are reported as normal, but non-specific signs such as high signal along the corticospinal tracts are occasionally observed on T2-weighted imaging (65–67). In sharp contrast with clinical sequences, advanced quantitative spinal protocols allow for the detailed and quantitative characterization of spinal gray and white matter integrity (38, 47, 58, 68). These protocols provide high resolution, high SNR, and high CNR images compared to standard clinical sequences. Furthermore, purpose-designed spinal protocols are based on mathematical MR signal modeling (e.g., diffusion-based methods, quantitative magnetization transfer, and MR spectroscopy) and the derived outputs can be quantitatively interpreted to provide accurate, motion-corrected white, and gray matter metrics. Gross axonal and gray matter loss have traditionally been estimated by measuring spinal cord cross-sectional areas at specific levels and interpreted as a proxy of atrophy in the context of reference normative values (69–72). The “cross-sectional approach” consists of estimating a mean cord cross-sectional area over a representative number of slices at a given vertebral level (70, 71, 73, 74), which can be relatively easily calculated from conventional MR sequences such as T1- or T2-weighted images. A variety of indexes, such as A-P dimension, L-R width, and radial distance can be derived from the cross-sectional area (CSA) approach. These measures reflect on different aspects of pathology, such as global vs. regional, lateral vs. anterior tissue loss, and are often interpreted as predominantly motor or sensory involvement (70, 75). More specific gray and white matter measures can be derived from higher resolution images followed by tissue-type segmentation methods (72, 76, 77). Novel quantitative approaches, such as tensor based morphometry and surface based-morphometry permit a more fine-grained characterization of cord topography and the definition of disease-associated signatures (74, 78). Recent studies demonstrated that spinal cord atrophy, especially gray matter atrophy, correlates with disability and disease progression and may be predictive of respiratory failure and of survival in ALS (58, 70, 72, 73, 79). The main findings of structural spinal cord studies are summarized in Table 1. Table 1. Quantitative spinal imaging studies in ALS, ALS, amyotrophic lateral sclerosis; ALSFRS-r, the revised ALS functional scale; FA, fractional anisotropy; CSA, cross-sectional area; CST, corticospinal tract; FVC, force vital capacity; ihMT, inhomogeneous magnetization transfer; ihMTR, inhomogeneous magnetization transfer ratio; MD, mean diffusivity; MT, magnetization transfer; MTR, magnetization transfer ratio; MMT, manual muscle testing; SC, spinal cord; SOD1, superoxide dismutase 1 gene. Diffusion weighted imaging (DWI) relies on the evaluation of water diffusion in CNS tissues and is primarily used to characterize white matter integrity (90, 91). DWI-derived metrics, such as axial diffusivity (AD), mean diffusivity (MD), fractional anisotropy (FA), radial diffusivity (RD) enable the quantitative characterization of white matter integrity. Novel high-directional approaches, such as high-angular resolution diffusion imaging (92), q-ball imaging (93), diffusion kurtosis imaging (94), diffusion basis spectrum imaging (DBSI) (95) are particularly well-suited to assess the integrity of crossing-fibers (96, 97). Emerging diffusion techniques such as neurite orientation dispersion and density imaging (NODDI) (98) help to estimate the microstructural attributes of dendrites and axons (99). While in ALS NODDI has been primarily used in cerebral studies in ALS (100, 101), it also has been also piloted in spinal applications (90, 102). Specific DTI indices (AD, RD) have been associated with specific pathological processes, such as axonal (103, 104) vs. myelin-related (105, 106) degeneration, but this interpretation is likely to be simplistic, as DTI measures are affected by axonal density, axonal diameter, myelin thickness and fiber orientation, fiber coherence, and acquisition parameters. DTI has been extensively used to study cerebral changes in ALS and describe phenotype-associated (107), genotype-specific (27), presymptomatic (32), and longitudinal white matter changes in the brain (81). In contrast to the plethora of cerebral DTI studies, relatively few spinal DTI studies have been published in ALS to date (58, 69, 73, 80–82, 85). These have consistently highlighted both motor and sensory tract alterations (Table 1). Hydrogen nuclei linked to macromolecules such as the proteins and lipids of the myelin sheet have an extremely short T2 signal. While these macromolecules are not directly detectable by standard MRI sequences, magnetization transfer (MT) imaging enables the characterization of these structures. Macromolecular spins can be saturated using an off-resonance RF pulse, then the magnetization transfer between bound and free pools can be measured (108). Magnetization transfer occurs by means of cross relaxation processes, such as dipole-dipole interactions and chemical exchange. Magnetization transfer ratio (MTR) is calculated as the percentage difference of MT images with macromolecules signal saturation and one without. MTR enables inferences on myelin content, axonal count, and density as shown by three MS histological studies, and has been used extensively to assess demyelination, remyelination, and degeneration in MS (109–111). Conversely, relatively few studies have used cerebral MT imaging in ALS, and the majority of these focused on corticospinal tract alterations (112–115). Relatively few studies evaluated spinal MT changes in ALS, but they have shown progressive reduction overt time and correlation with muscle weakness (58, 69, 73). 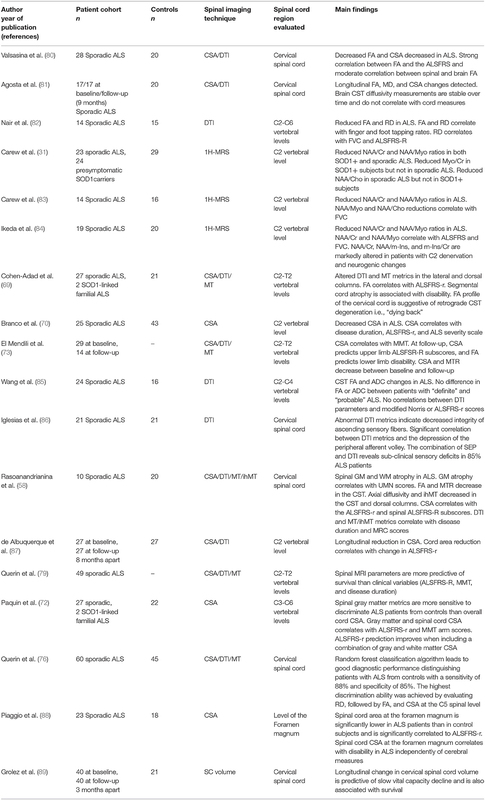 The key findings of spinal MT imaging studies in ALS and associated technical challenges are summarized in Tables 1, 2. Table 2. The advantages and methodological challenges associated with specific spinal imaging techniques. Inhomogeneous magnetization transfer (ihMT) imaging is a novel method (116, 117), which allows the unprecedented characterization of myelin integrity, by isolating key myelin components from the broader macromolecular pool. ihMT shows unparalleled potential to detect and quantify demyelination (118) and may be adapted to spinal applications. ihMT imaging has already been applied to ALS cohorts and demonstrated significant correlation with muscle strength and disability profiles (58). Magnetic resonance spectroscopy (MRS) is well-established, non-invasive imaging tool which provides neurochemical insights based on the concentration and relaxation profile of specific metabolites in cerebral and spinal tissues. MRS has been extensively used in cerebral studies of ALS (119), used to assess the therapeutic effect of Riluzole (120, 121), and also used to study brainstem metabolic alterations (122). Cross-sectional and longitudinal (123), single voxel and whole brain multi-voxel studies have both contributed to our understanding of ALS pathophysiology (124). The main targets of proton spectroscopy (1H-MRS) include the following metabolites; N-Acetyl Aspartate (NAA), creatine (Cr), choline (Cho), and myo-Inositol (Myo). These metabolites are typically associated with neuronal integrity/viability (NAA), tissue energy metabolism (Cr), membrane integrity (Cho), and glial function (Myo). (125). Relatively few studies have used 1H-MRS to characterize metabolic changes at the spinal level, and the majority of these studies focused on multiple sclerosis (126, 127) MRS however seems particularly applicable to ALS cohorts, where it promises the characterization of presymptomatic changes and by including both the upper and lower motor components of the motor system, it has led to particularly significant clinico-radiological correlations (31, 83, 84). For the contribution of MRS studies to ALS research and specific methodological considerations please see Tables 1, 2. Functional MRI (fMRI) detects local variations in blood oxygenation level-dependent MR signal at rest and during activation paradigms (128). FMRI has been extensively applied to ALS cohorts to describe network changes and assess altered activation patterns when performing motor or cognitive tasks (129–131). Following decades of successful cerebral studies, the first spinal fMRI studies have now been published (55, 132). Emerging spinal cord fMRI studies in healthy controls provide proof of feasibility and the first studies using spinal fMRI in neurological conditions are underway (133). Quantitative spinal MRI studies in ALS have consistently detected corticospinal tract and anterior horns degeneration and changes correlated with functional disability (36, 58, 80, 82, 85). Segmental spinal cord atrophy was not only linked to muscle weakness (58, 70, 88), but also to electrophysiological markers such as transracial magnetic stimulation (TMS) and motor evoked potentials (69). Two studies have demonstrated that both white and gray matter atrophy contributes to global cord atrophy in ALS (58, 72), but a recent study indicates that cord atrophy in ALS may be predominantly driven by anterior horn degeneration (72), confirming the role of spinal MRI as a putative LMN marker. DTI and MTR indices of the corticospinal tract (CST) correlated with TMS facilitation motor thresholds, a functional parameter that reflects pyramidal tract integrity. In contrast to the plethora of longitudinal cerebral studies in ALS (21), relatively few longitudinal spinal studies are available to demonstrate that spinal MRI metrics can track subtle progressive changes over time (73, 81, 87, 89). These longitudinal studies captured decreasing CST MTR and progressive cord atrophy (73, 87) While some longitudinal studies also captured progressive DTI alterations (81), other studies did not (73). Some studies suggest that CSA estimates may be more reliable markers of longitudinal cord pathology than MTR or DTI metrics (73, 87). Progressive cord atrophy not only mirrors clinical progression, but early cervical cord atrophy is thought to predict respiratory dysfunction in ALS (89, 134). Furthermore, spinal MRI metrics may be superior predictive indicators of survival than clinical measures (79). 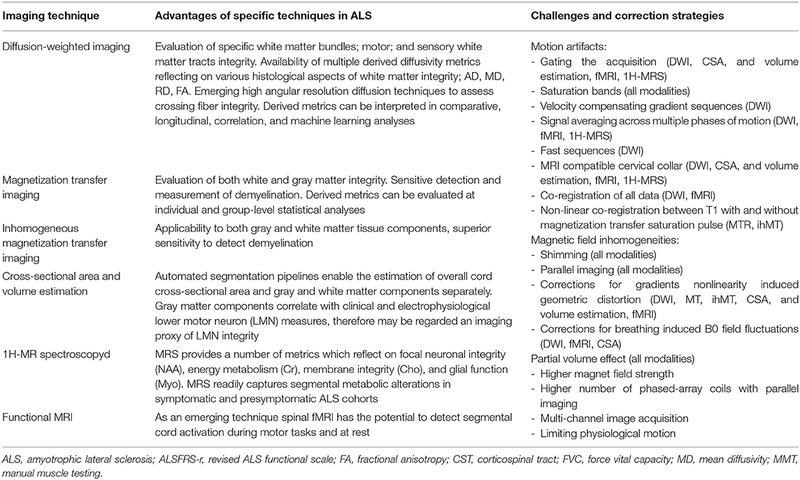 Given the scarcity of longitudinal spinal imaging studies in ALS, it remains to be established which imaging metrics capture early ALS-associated changes, therefore may be used in diagnostic applications, and which metrics can track changes in the later stages making them suitable as monitoring markers. Several spinal MRI studies (58, 69) have captured dorsal column degeneration using DTI, MT, and ihMT imaging, and one study demonstrated progressive sensory tract degeneration over time (135). Dorsal column pathology can be detected relatively soon after symptoms onset, which suggests that sensory involvement is a core and relatively early feature of ALS. Combined spinal DTI and neurophysiology studies have also confirmed considerable sensory pathway degeneration in ALS patients without sensory symptoms (86). The combined MRI-neurophysiology approach revealed sub-clinical sensory deficits in 85% of ALS patients. These findings suggest that sensory dysfunction may have been underestimated by previous studies and that sensory afferent pathways may be affected early in the course of ALS and are important facets of ALS pathogenesis (69, 86). In contrast to longitudinal cerebral studies (4, 32), longitudinal spinal studies suggest that dorsal column metrics (73), and CST DTI indices (87) may be relatively constant (135). 1H-MRS studies in ALS have shown reduced NAA/Cr and NAA/Myo ratios at the C2 vertebral level (31, 83, 84). One spinal MRS study captured reduced NAA/Myo and NAA/Cr ratios in presymptomatic superoxide dismutase 1 gene (SOD1+) carriers (31). In addition to group-level differences in symptomatic and presymptomatic ALS cohorts, NAA/Myo and NAA/Cho reductions correlate with force vital capacity (FVC) and revised ALS functional scale (ALSFRS-r) and inversely correlated to the rates of decline (31, 83, 84). Existing spinal studies in ALS indicate that it is possible to detect disease-specific imaging signatures at a group level, and emerging machine-learning studies (76) have demonstrated that it may be possible to classify individual scans into “ALS” and “Healthy” groups. Despite the pioneering studies however, it is clear that spinal imaging lags behind cerebral imaging. Cerebral imaging has shown that phenotype and genotype specific patterns can be detected, multi-time point longitudinal studies have shown divergent rates of gray and white matter degeneration, studies have been validated by post mortem examination and robust multi-site studies have also been published (136). It is likely that improved coil designs with higher number of phased-array elements, new generation scanners with higher gradients optimized for advanced diffusion-weighted imaging, ultra-high filed platforms with superior spatial resolution, and SNR, spinal imaging will contribute unprecedented insights in ALS. It is conceivable that spinal imaging will contribute to the longstanding debate about dying back and dying forward, and ALS being a primarily spinal vs. cerebral disease. Spinal imaging provides a unique opportunity to appraise both lower and upper motor neuron degeneration. It is also likely that imaging sequences currently primarily used in cerebral imaging in ALS such as resting state fMRI, task-based fMRI, quantitative susceptibility weighted imaging, presymptomatic imaging, texture analyses, and post mortem imaging will filter down to spinal applications. Data-sharing initiatives, cross-platform harmonization, inclusion of upper motor neuron (UMN) and lower motor neuron (LMN) predominant ALS cohorts, correlations with advanced neurophysiological techniques are trends of ALS imaging which is likely to be adopted in spinal studies. One of the key ambitions of multiparametric spinal imaging is to overcome the methodological challenges of thoracic and lumbar imaging. The momentous advances in spinal imaging in ALS suggest the spinal metrics may soon be used as validated diagnostic, monitoring, and prognostic markers, contributing both to individualized patient care and pharmacological trials. ME, GQ, PB, and P-FP contributed equally to the conceptualization, drafting, and revision of the manuscript. Peter Bede is supported by the Health Research Board (HRB—Ireland; HRB EIA-2017-019), the Iris O’Brien Foundation, the Irish Institute of Clinical Neuroscience IICN—Novartis Ireland Research Grant, and the Research Motor Neuron (RMN-Ireland) Foundation. P-FP is supported by the French Association for Myopathies (AFM-Telethon), the Institute for Research in Brain and Spinal Cord (IRME) the French Association for Research in ALS (ARSLA) and the Target ALS Foundation. 1H-MRS, proton spectroscopy; A-P, anterior-posterior; AD, axial diffusivity; ALS, Amyotrophic lateral sclerosis; ALSFRS-R, revised ALS functional scale; Cho, choline; CNR, contrast-to-noise ratio; Cr, creatine; CSA, cross-sectional area; CSF, cerebrospinal flood; CST, corticospinal tract; DTI, diffusion tensor imaging; FA, fractional anisotropy; fMRI, functional MRI; ihMT, Inhomogeneous magnetization transfer; LMN, lower motor neuron; MD, mean diffusivity; MRI, Magnetic resonance imaging; MRS, Magnetic resonance spectroscopy; MT, Magnetization transfer; MTR, Magnetization transfer ratio; Myo, myo-Inositol; NAA, N-Acetyl Aspartate; NODDI, neurite orientation dispersion and density imaging; RD, radial diffusivity; RL, right-left; SNR, signal-to-noise ratio; TMS, transracial magnetic stimulation; SOD1, superoxide dismutase 1 gene; SOD1+, presymptomatic superoxide dismutase 1 gene. 2. Charcot J, Joffroy A. Deux cas d’atrophie musculaire progressive avec lésions de la substance grise et de faisceaux antérolatéraux de la moelle épinière. Arch Physiol Norm Pathol. (1869) 1:354–7. 100. Broad RJ, Gabel MC, Dowell NG, Schwartzman DJ, Seth AK, Zhang H, et al. Neurite orientation and dispersion density imaging (NODDI) detects cortical and corticospinal tract degeneration in ALS. J Neurol Neurosurg Psychiatry. (2018) doi: 10.1136/jnnp-2018-318830. [Epub ahead of print]. 101. Wen J, Zhang H, Alexander DC, Durrleman S, Routier A, Rinaldi D, et al. Neurite density is reduced in the presymptomatic phase of C9orf72 disease. J Neurol Neurosurg Psychiatry. (2018). doi: 10.1136/jnnp-2018-318994. [Epub ahead of print]. 115. Kato Y, Matsumura K, Kinosada Y, Narita Y, Kuzuhara S, Nakagawa T. Detection of pyramidal tract lesions in amyotrophic lateral sclerosis with magnetization-transfer measurements. AJNR Am J Neuroradiol. (1997) 18:1541–7. 135. El Mendili MM. Analysis of the Structural Integrity of the Spinal Cord in Motor Neuron Diseases Using a Multi-Parametric MRI Approach. Doctoral dissertation, Université Pierre et Marie Curie-Paris VI (2016). Copyright © 2019 El Mendili, Querin, Bede and Pradat. This is an open-access article distributed under the terms of the Creative Commons Attribution License (CC BY). The use, distribution or reproduction in other forums is permitted, provided the original author(s) and the copyright owner(s) are credited and that the original publication in this journal is cited, in accordance with accepted academic practice. No use, distribution or reproduction is permitted which does not comply with these terms.